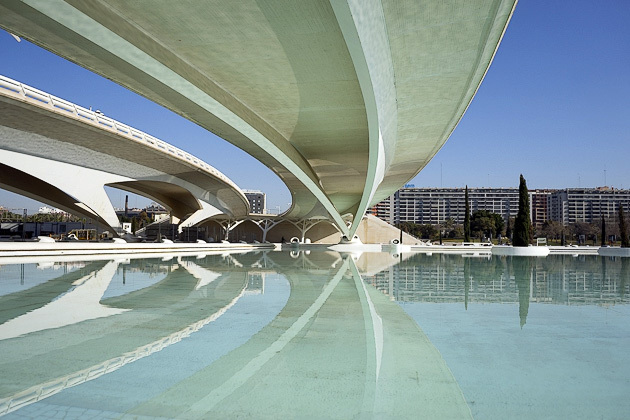 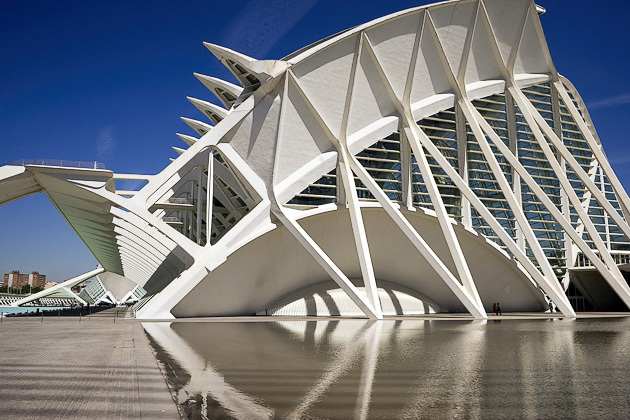 Born in Valencia in 1951, Santiago Calatrava has become one of the world’s most successful architects. 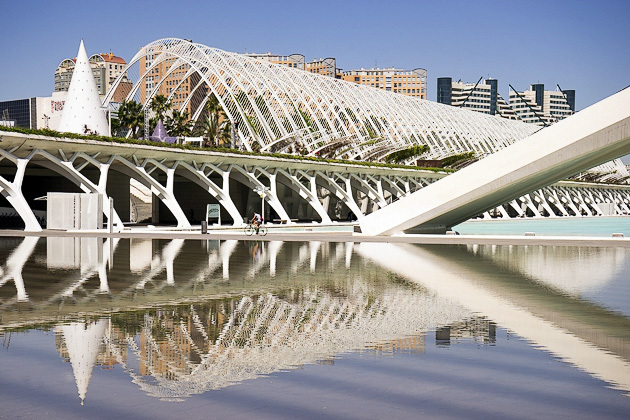 With futuristic designs that defy the laws of physics, his bridges, pavilions and skyscrapers are scattered across the world, from Malmö to Milwaukee, Rio de Janiero to Doha. 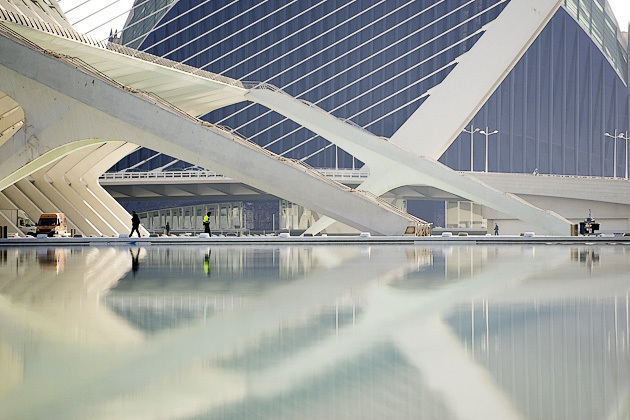 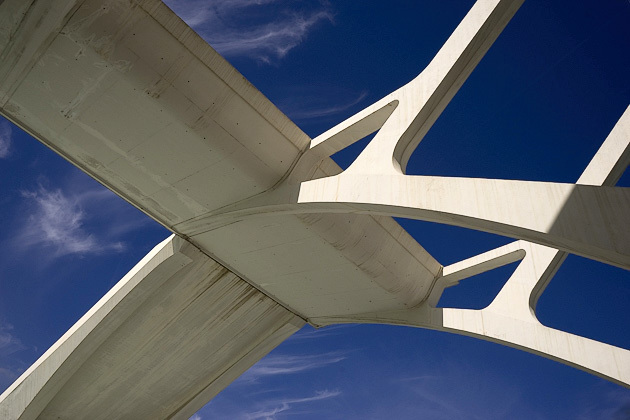 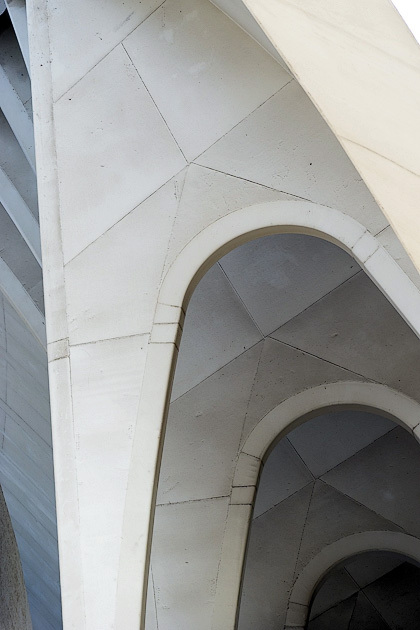 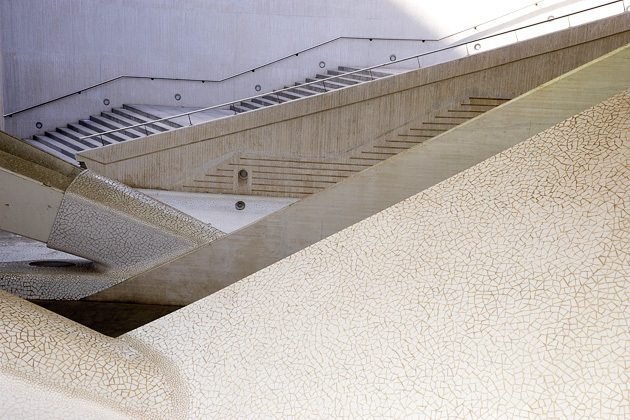 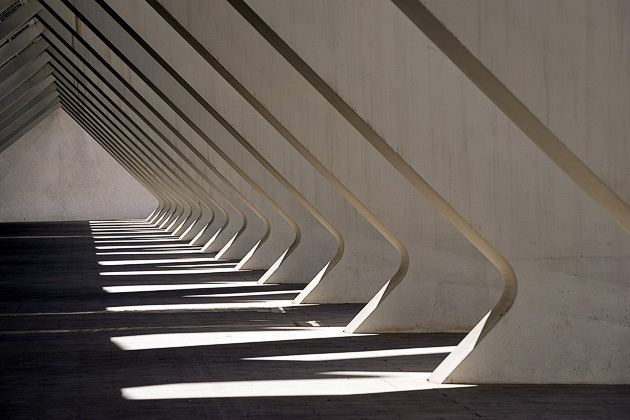 His work is singular — when you see a Calatrava building, you know it’s a Calatrava building. 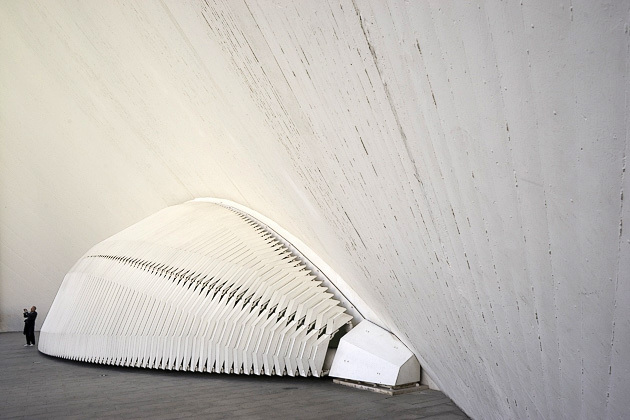 In the USA, he’s most famous for NYC’s spiky, bird-like World Trade Center Transportation Hub, set to open in 2016. 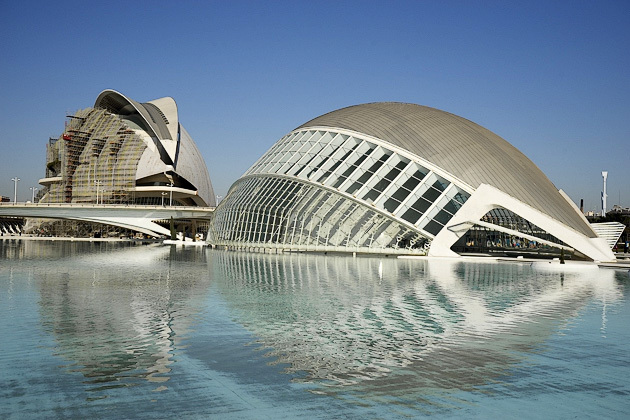 But Valencia is his home, and this is the city upon which he’s most indelibly left his mark. 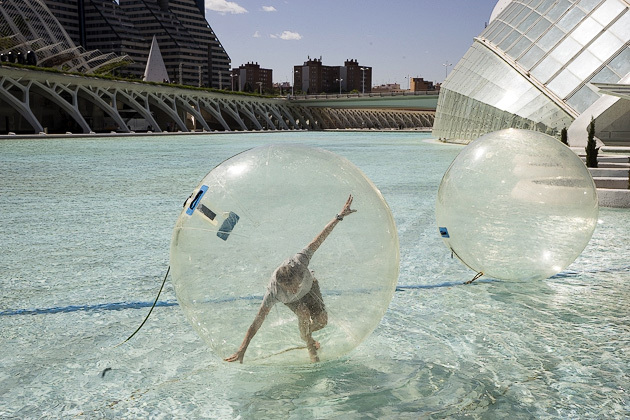 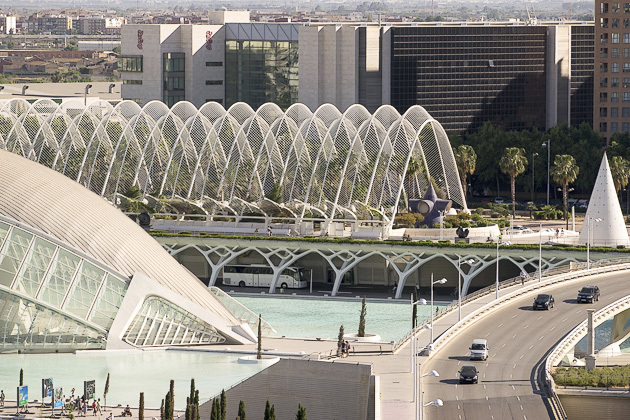 The eastern section of the Turia Riverbed is a gigantic Calatrava sandbox known as the Ciudad de las Artes y Ciencias, in which the architect was given free rein to do anything he wanted… and apparently what he wanted to do was go crazy. 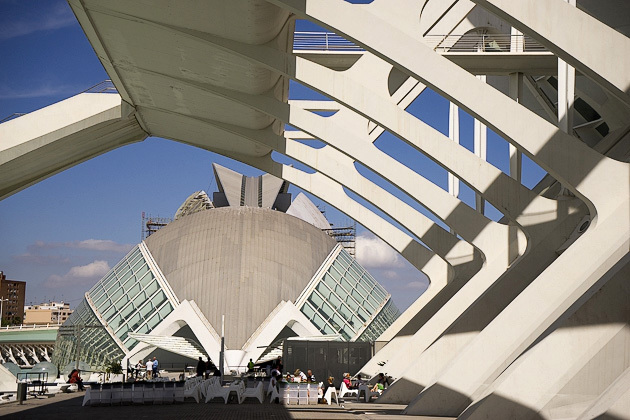 The CAC is unlike any place in the world. 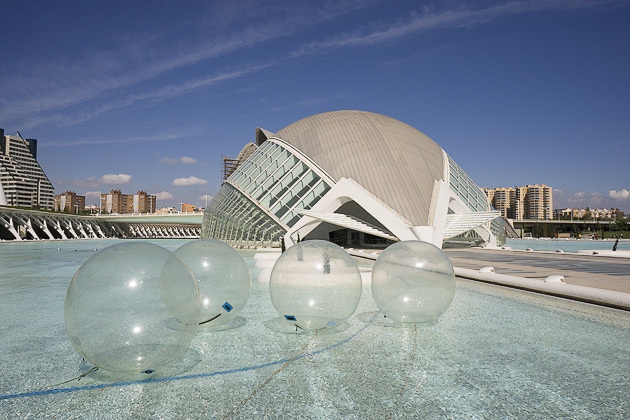 Giant egg-shaped buildings (or building-shaped eggs?) 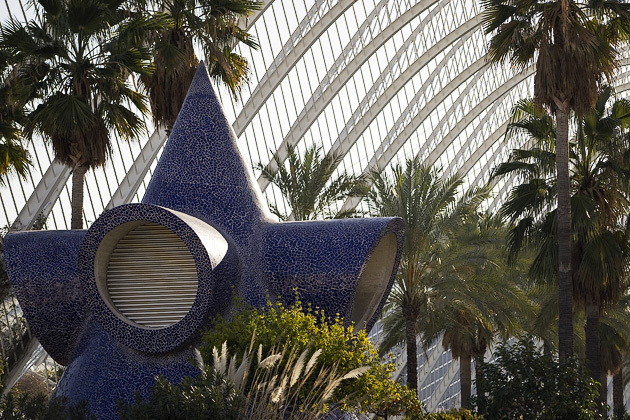 grow out of a floor covered in shimmering white mosaic tiles and shallow pools of turquoise water. 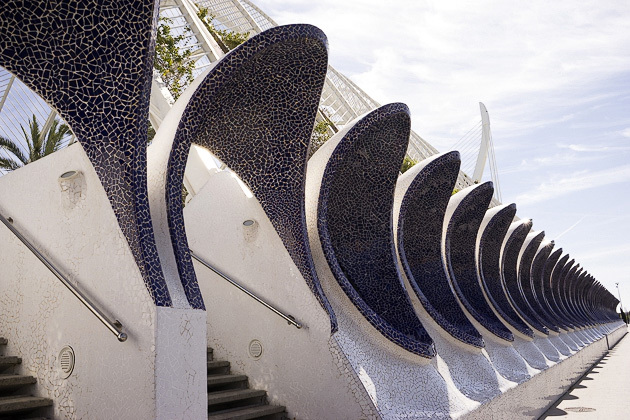 With its lines, curves, reflections and angles, it’s a geometric wonderland; the shapes of the structures seem to shift with every step, constantly revealing new designs and patterns. 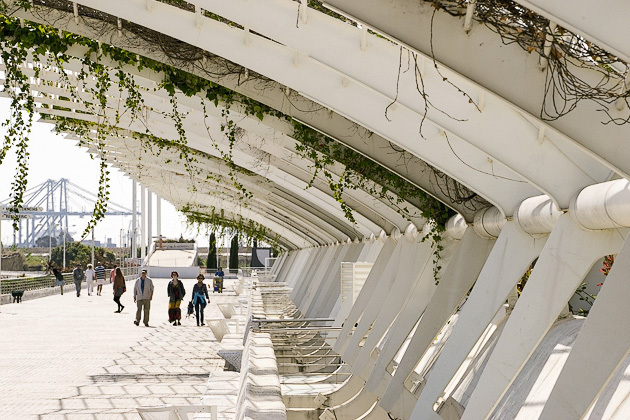 And the photo opportunities are limitless… you could, for example, take a stunning picture of the Pont de l’Assut bridge, lining up its straight white needles with the Agora auditorium in the background. 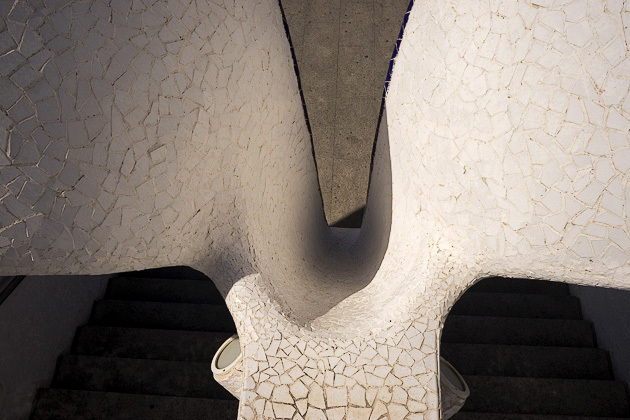 And then move one meter to the left, and an entirely new perspective would appear. 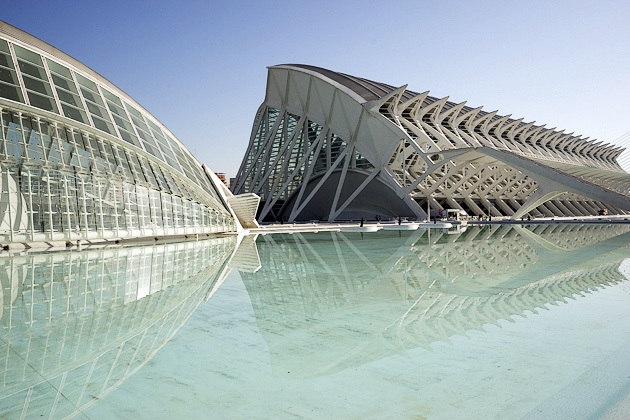 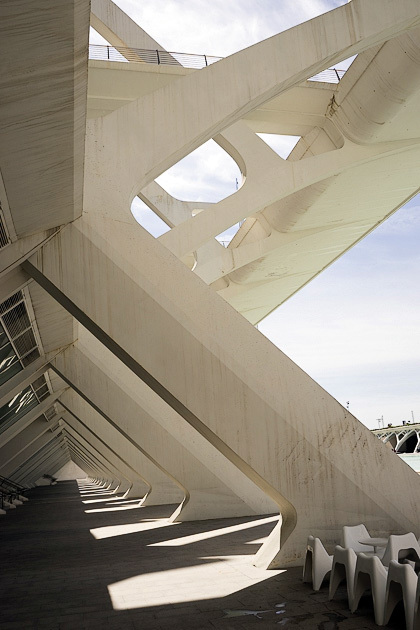 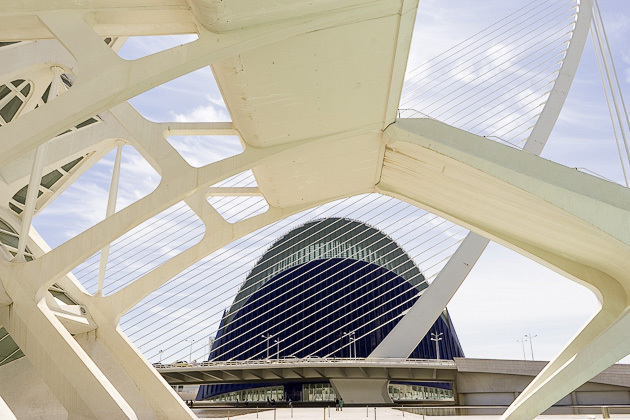 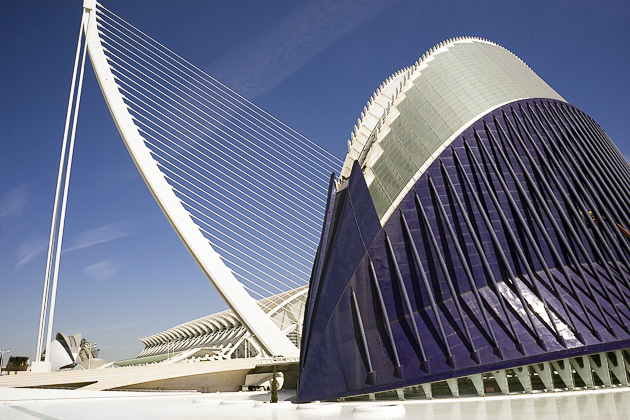 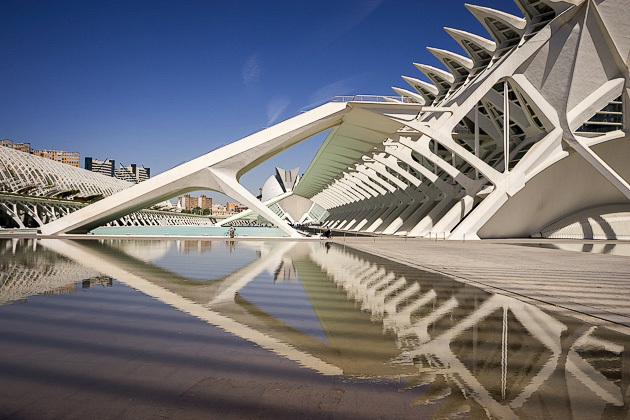 Industry and film have long since discovered the photogenic values of Valencia’s Ciudad de Artes y Ciencias. 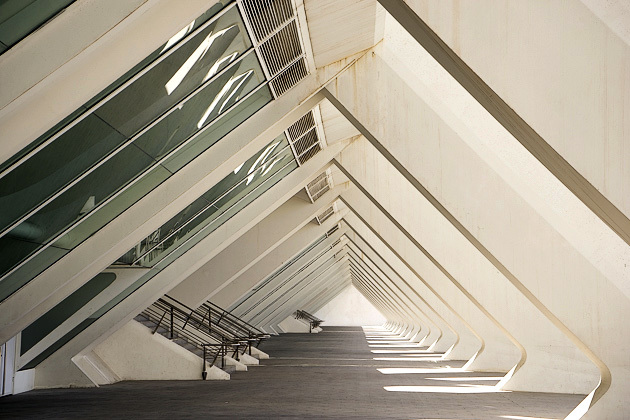 We’ve seen it in multiple films and TV shows, and its glimmering passageways are a popular stage for automotive ads. 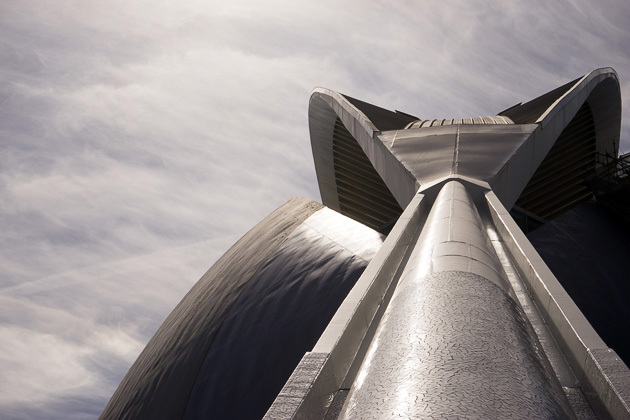 Most famously, the CAC had a starring turn as the futuristic city in Disney’s Tomorrowland. 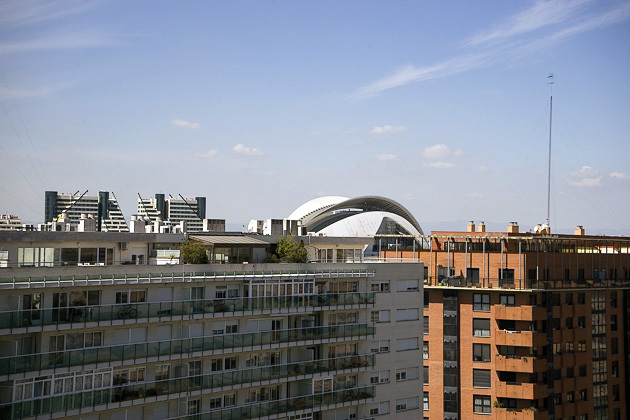 Here’s a quick rundown of the Ciudad’s buildings, starting from the west and moving east. 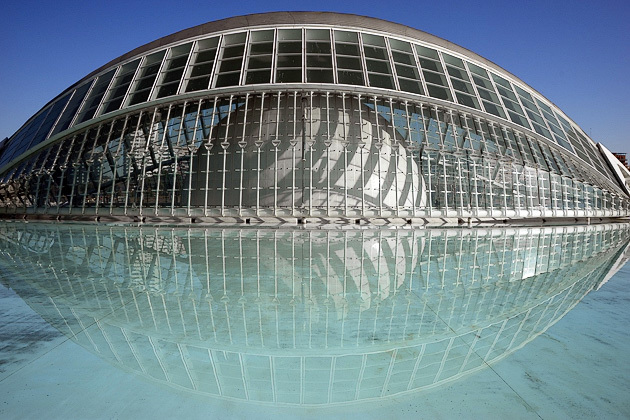 First up is the Palau de les Arts Reina Sofia, the tallest opera house in the world. 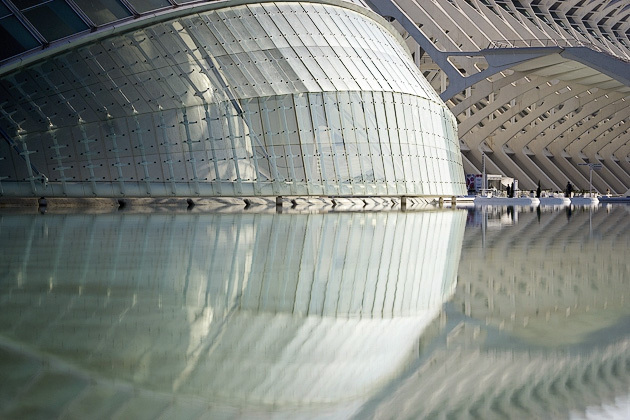 Underneath its elliptical shadow, rising from the water like the headquarters of the Legion of Doom, is L’Hemisfèric, which is an IMAX theater. 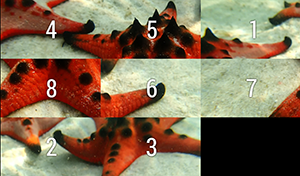 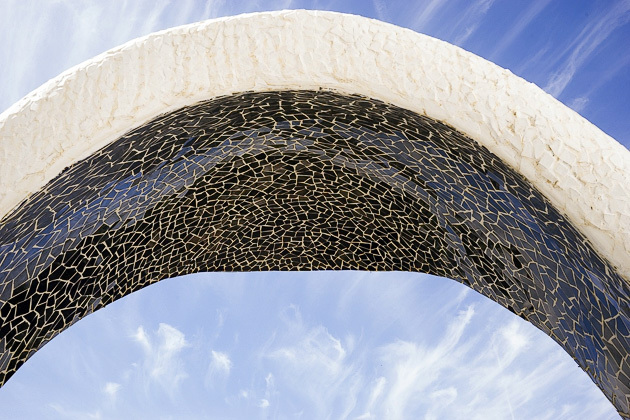 It resembles a giant eyeball, complete with an eyelid that can be raised and lowered. 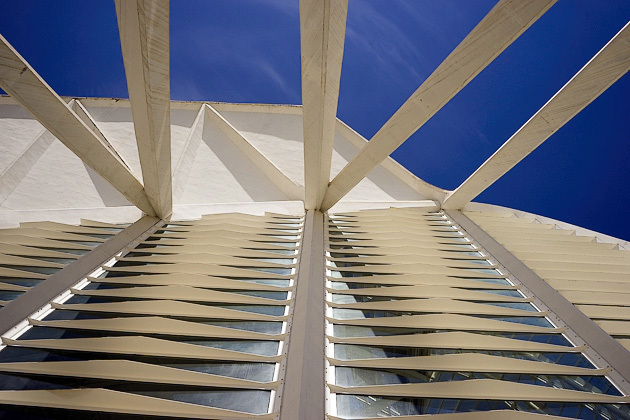 It might be our favorite building in the CAC. 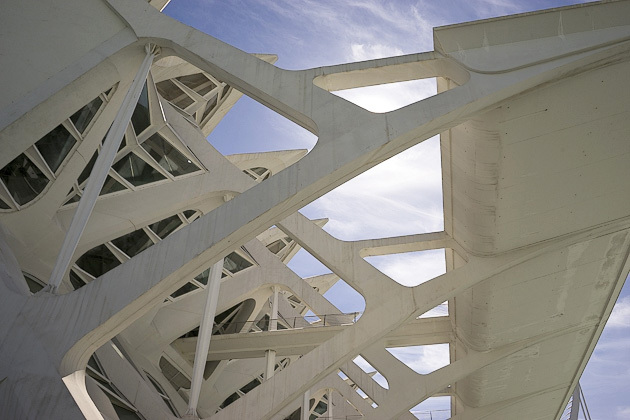 Next up is the skeleton of a space whale… or wait, no, that’s the Museu de les Ciències Príncipe Felipe, Valencia’s Science Museum. 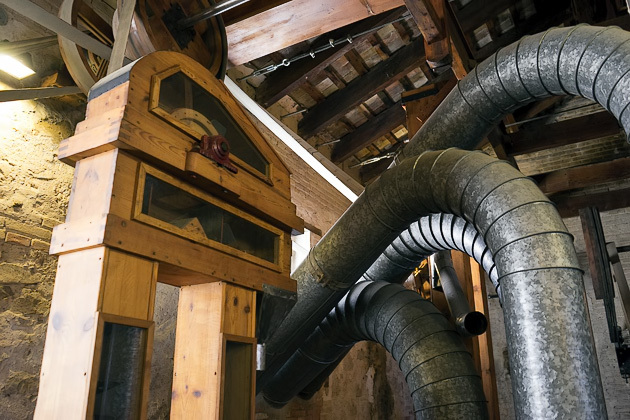 It’s geared to kids, and unfortunately the exhibits are poorly done, but the museum is worth visiting if only to admire the interior architecture. 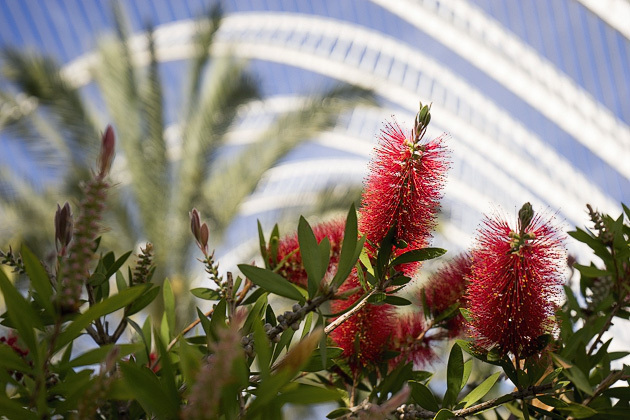 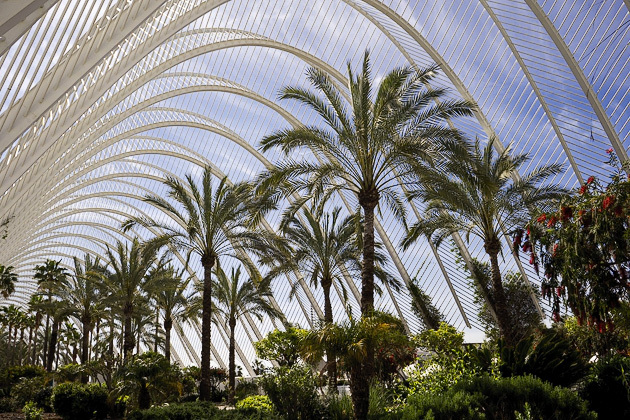 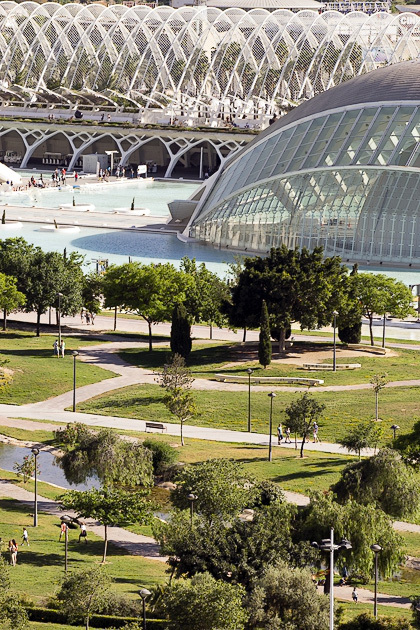 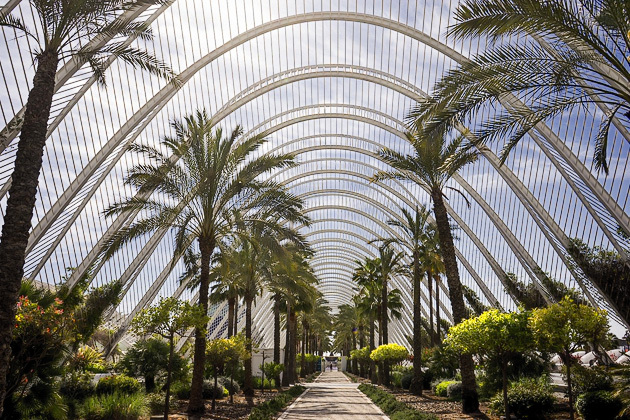 Across the way, you’ll find L’Umbracle, which is a tree-lined promenade featuring Valencian flora and sculptures, underneath a loosely-connected grid of arches. 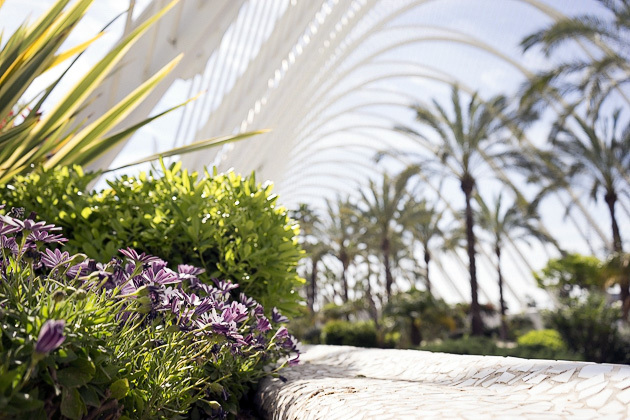 On weekend nights, L’Umbracle converts into the scene of a popular club. 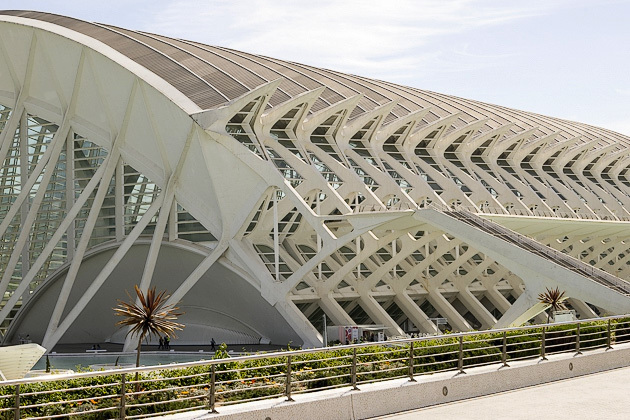 After crossing under the harp-shaped Pont de l’Assut de l’Or (Bridge of the Gold Dam), you’ll find the newest addition to the Ciudad de Artes y Ciencias: l’Agora. 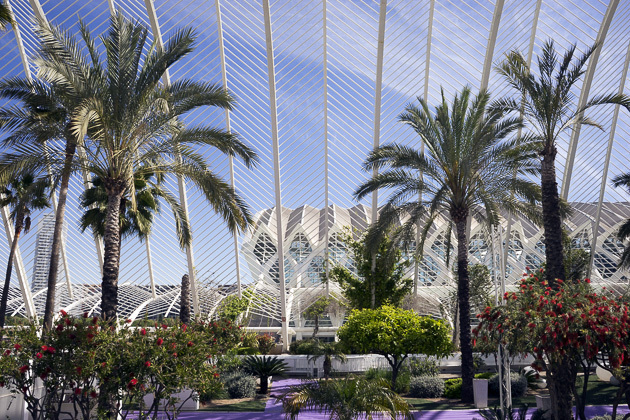 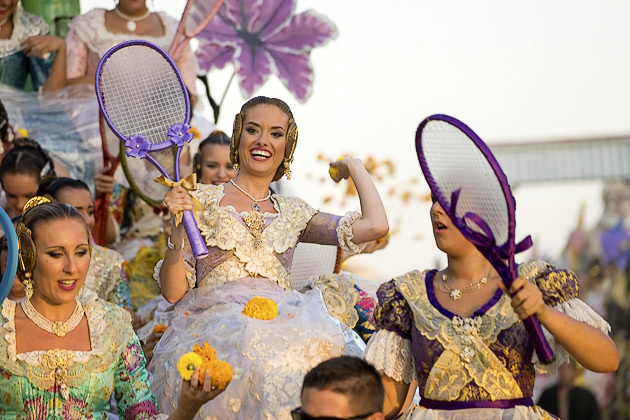 This multi-functional space opened in 2009, and hosts events like Valencia’s Tennis Open. 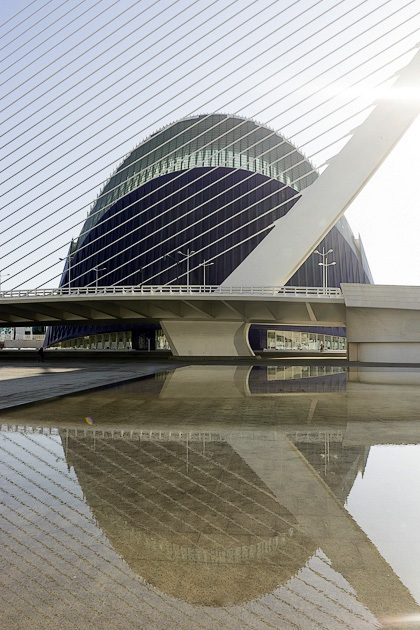 Tall and narrow, it doesn’t have much seating capacity, so is limited in function; besides tennis once a year, the city hasn’t found a good use for this €90 million building, making it a source of heavy criticism. 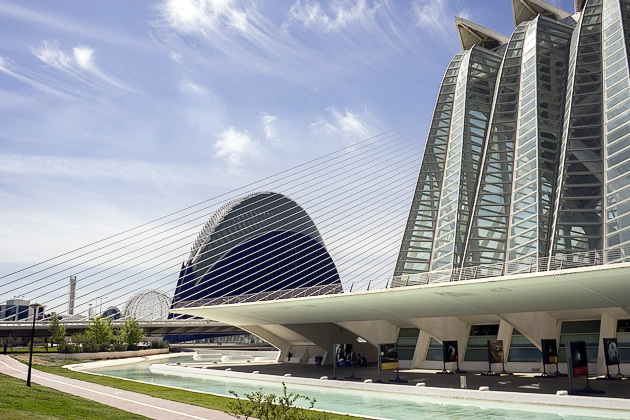 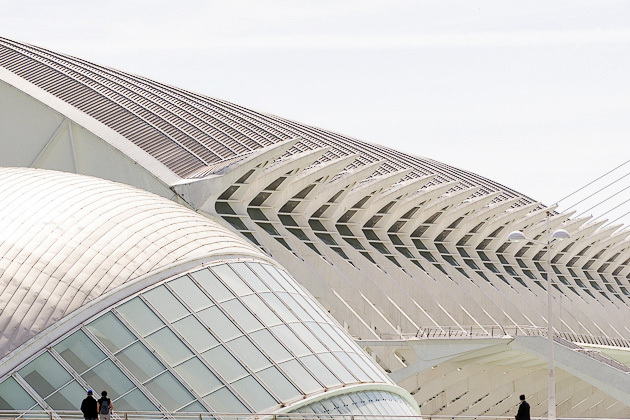 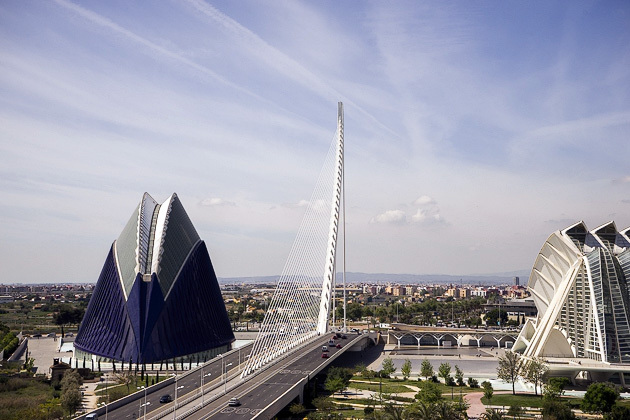 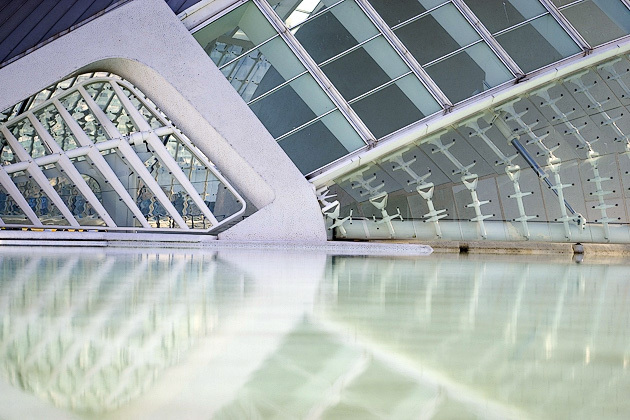 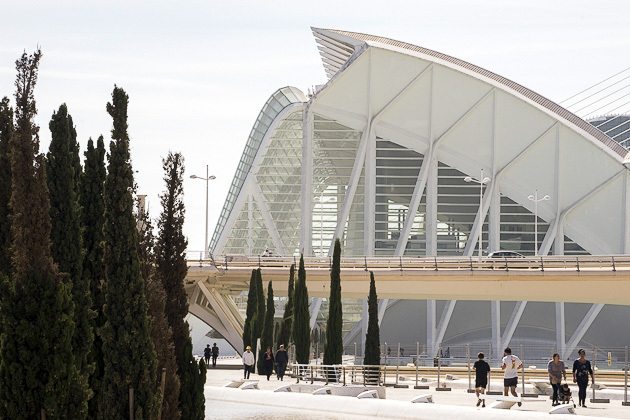 Controversy isn’t limited to l’Agora — the Ciudad de Artes y Ciencias has long been considered the perfect symbol of Valencia’s waste, mismanagement and corruption. 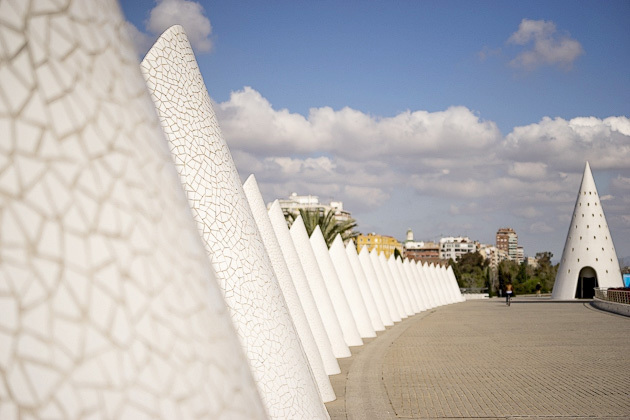 The project has cost the city nearly a billion euros, at a time when Spain has not exactly been flush with cash. 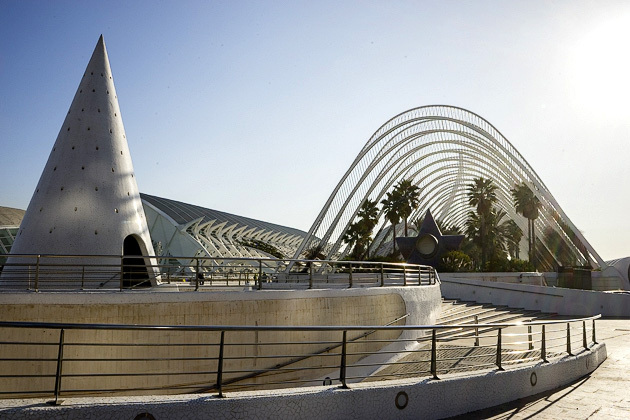 And while Calatrava might be a visionary, there are serious practical flaws in his designs. 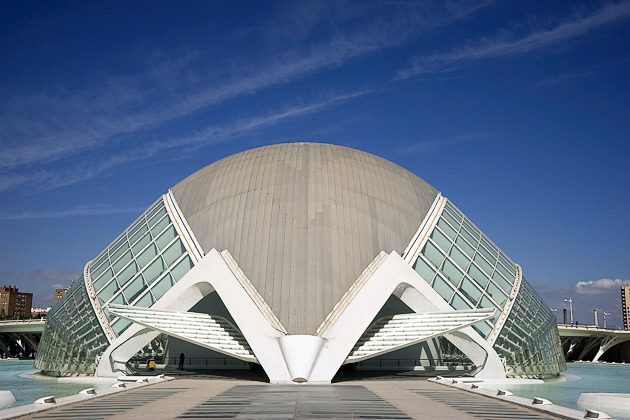 The Science Museum, for example, was built without elevators or fire escapes. 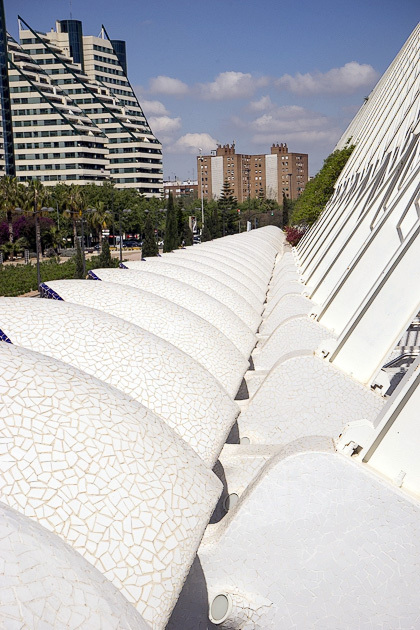 The opera house has 150 seats with an obstructed view of the stage, and the ceramic tiles which cover its facade have been falling off. 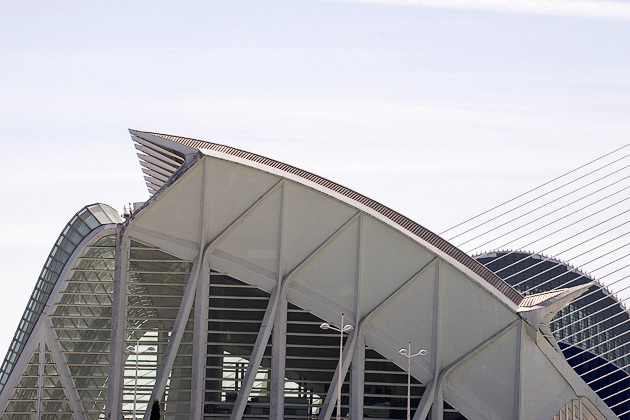 The city is currently trying to affix them more permanently, but in the meantime, the naked building looks rusty and hideous. 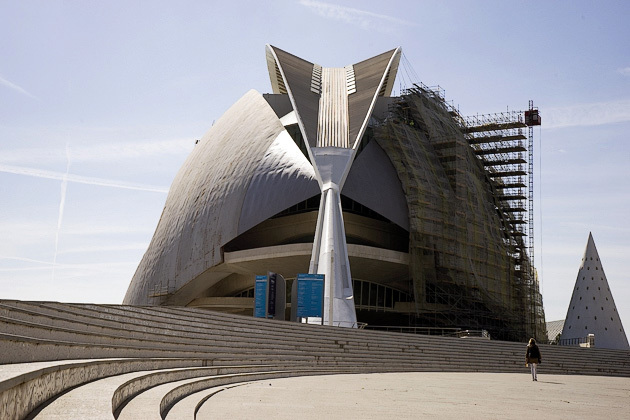 It’s just ten years old, so this is a bad omen for the future. 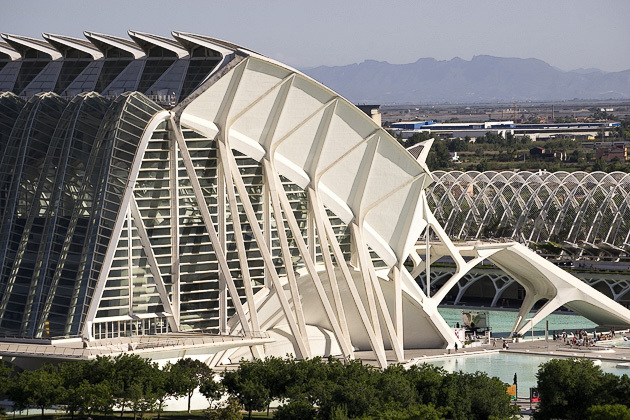 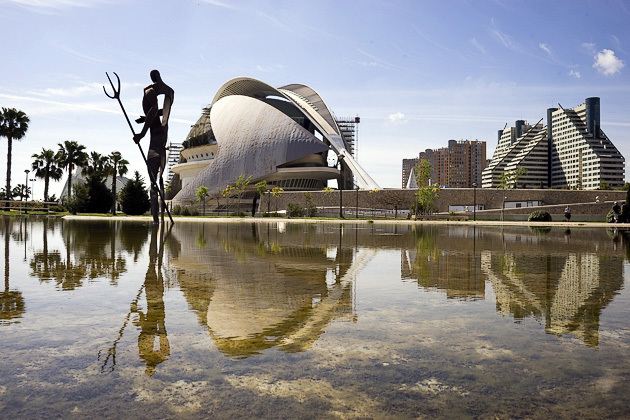 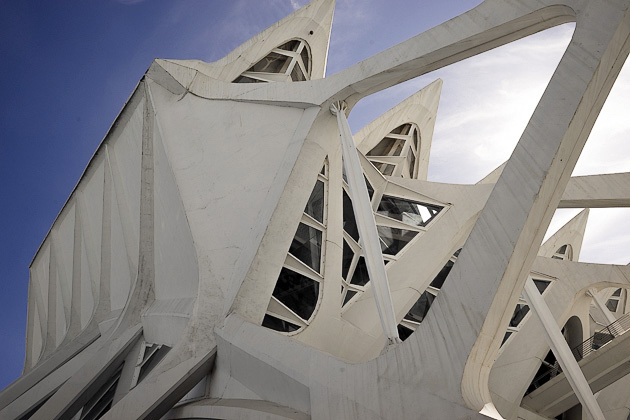 Valencians are split on their opinion of the CAC… there’s both pride in having some of the world’s most interesting architecture, and anger about the waste and uselessness of it all. 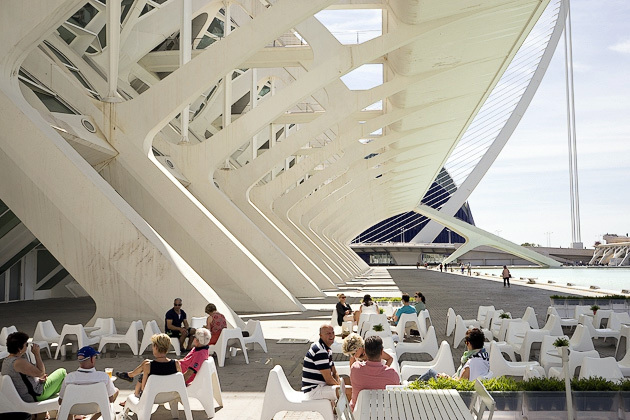 But for tourists, it’s an incredible place in which to spend some time. 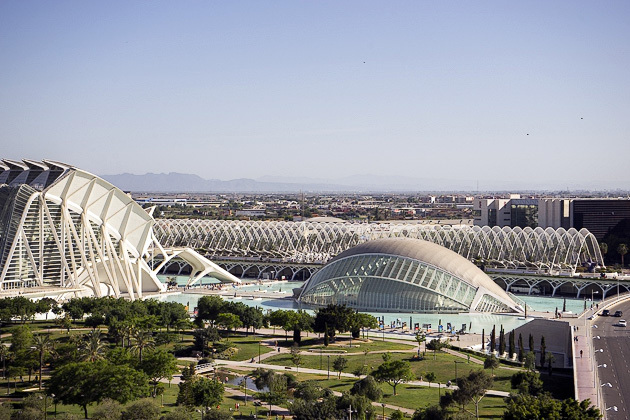 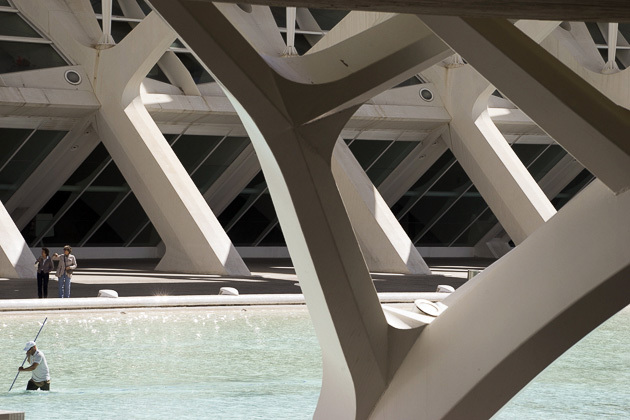 Although Jürgen and I find it hard to disagree with the criticisms, we consider the Ciudad de Artes y Ciencias is one of Valencia’s most memorable features. 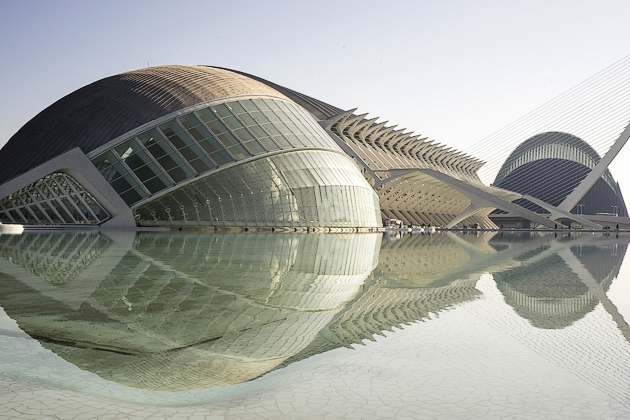 The City of Arts and Sciences An array of futuristic buildings occupying the eastern end of the Turia Riverbed Park, the City of Arts and Sciences is easily Valencia's most distinctive feature. 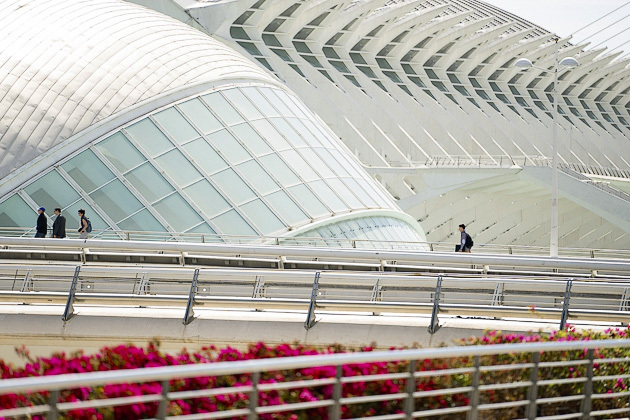 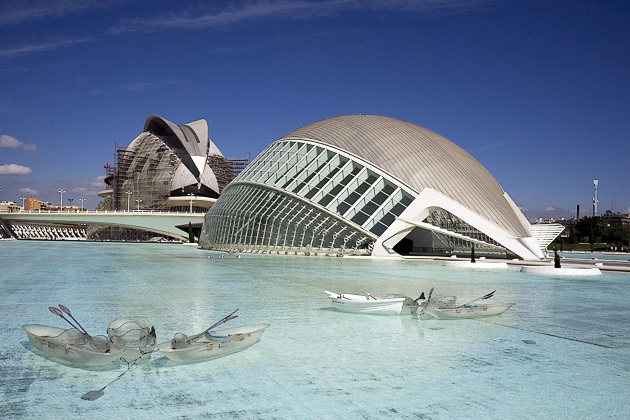 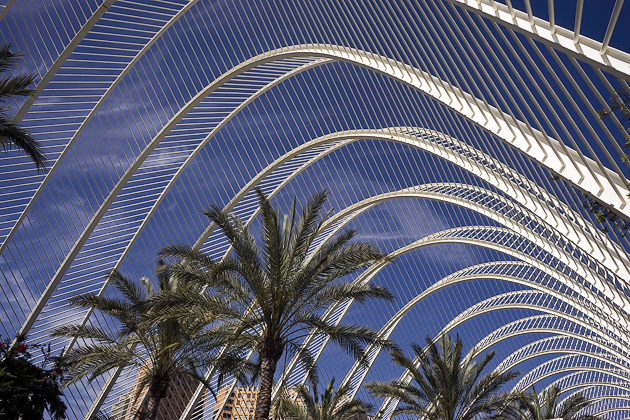 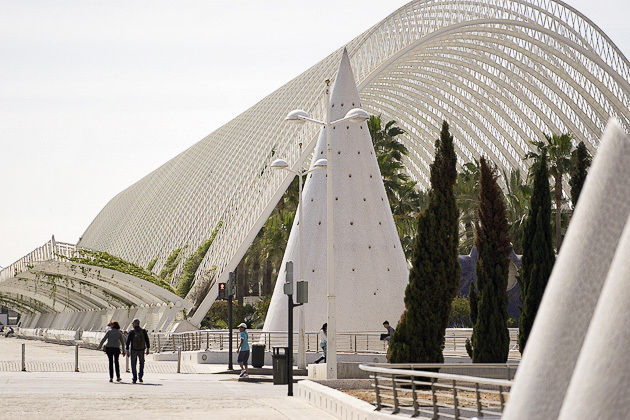 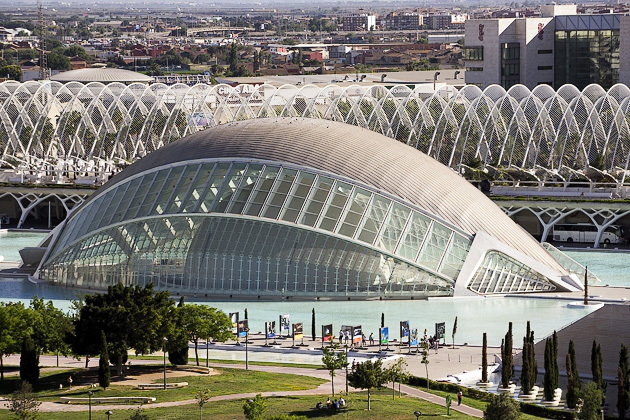 When people think "Valencia," the sharp white lines, shallow blue pools and tile-covered curves of Santiago Calatrava's creations are generally what spring to mind.